A miss is as good as a mile...or a smile. 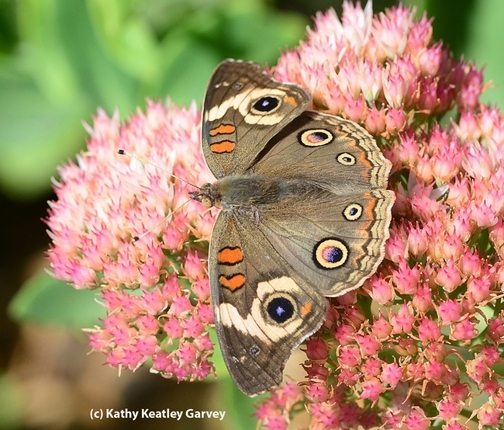 The Buckeye (Junonia coenia) is a striking butterfly patterned with eyespots and white bars. 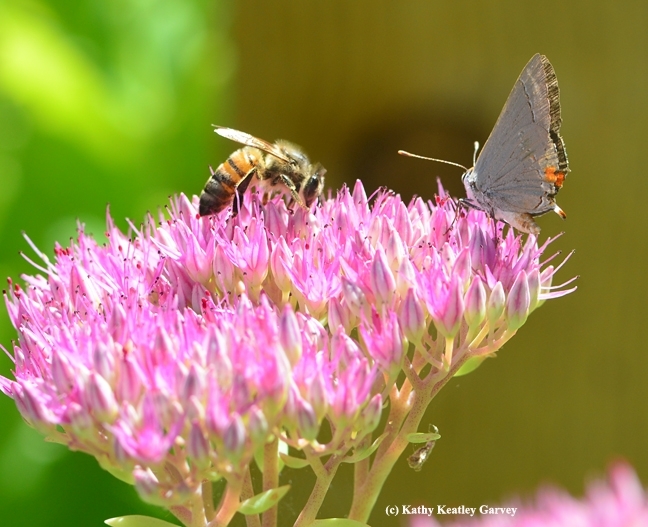 We saw one today nectaring on sedum, but with chunks of a wing missing. Perhaps a bird or a praying mantis tried to grab it. It narrowly escaped predation. 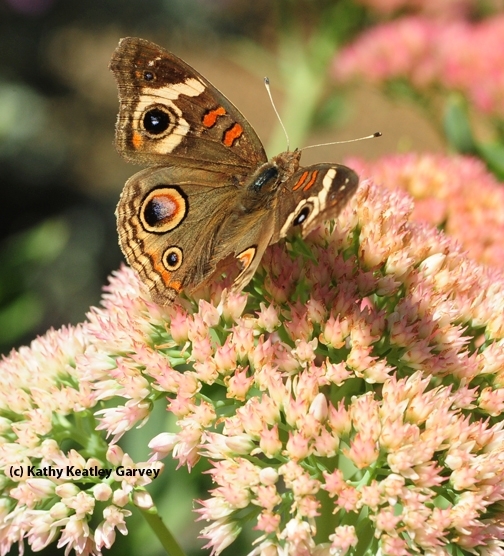 It's quite a common butterfly, as common as it is recognizable. The Buckeye "is found in southern Manitoba, Ontario, Quebec and Nova Scotia and all parts of the United States, except the Northwest," according to Wikpedia. It's also found throughout Central America and Colombia. 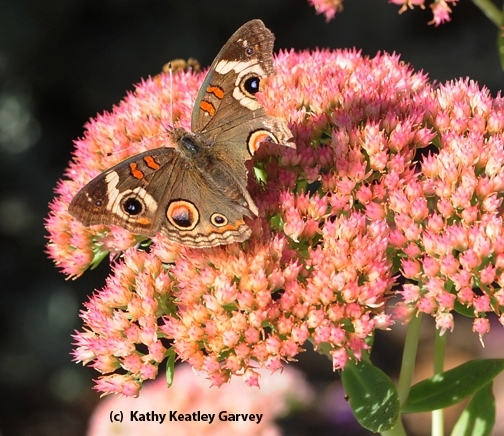 "The Buckeye breeds on plants containing bitter iridoid glycosides, including plantains (Plantago, especially P. lanceolata), various Scrophulariaceae (especially Fluellin, Kickxia), and Lippia (Lippia or Phyla nodiflora)," says butterfly expert Art Shapiro, UC Davis distinguished professor of evolution and ecology, on his website. "The spiny, black-and-white caterpillar has a bright orange head. Its behavior suggests its diet makes it virtually immune to vertebrate predation, but the pupa and adult are quite edible." Well, this is one adult that got away. if it's a streak of gray, you don't wash it away. 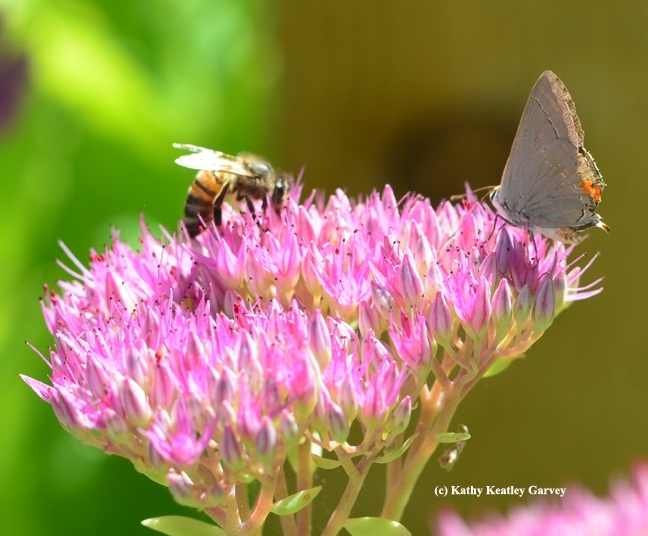 The gray hairstreak butterfly (Strymon melinus) is common on our sedum, a good fall plant for pollinators, including butterflies, honey bees, sweat bees and syrphid flies, aka hover flies or flower flies. 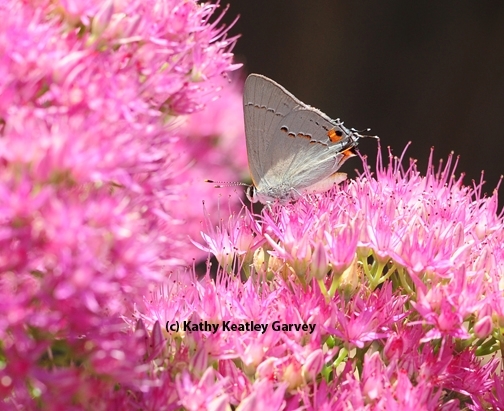 Butterfly expert Art Shapiro, distinguished professor of evolution and ecology at the University of California, Davis, says on his website that the gray hairstreak visits "an immense variety of flowers, both wild and cultivated. They are particularly addicted to Heliotrope and white-flowered Apiaceae." Apiaceae? That's the carrot family, which includes not only carrots but parsley, celery, Queen Ann'es lace, parsnip, cilantro, hemlock, fennel and anise. Heliotropes, which commonly yield pink-purple flowers, are good for graystreaks, but not good for horses. It's toxic and can induce liver failure, according to the ASPCA's Animal Poison Control Center. "If it looks like a duck, quacks like a duck, and walks like a duck, it's probably a duck," or so the saying goes. But if it looks like a honey bee, moves around on blossoms like a honey bee, and feeds on nectar and pollen like a honey bee, it may not be a honey bee. It could be a flower fly or syrphid in the Syrphidae family. The syrphids suffer from multiple cases of mistaken identity. 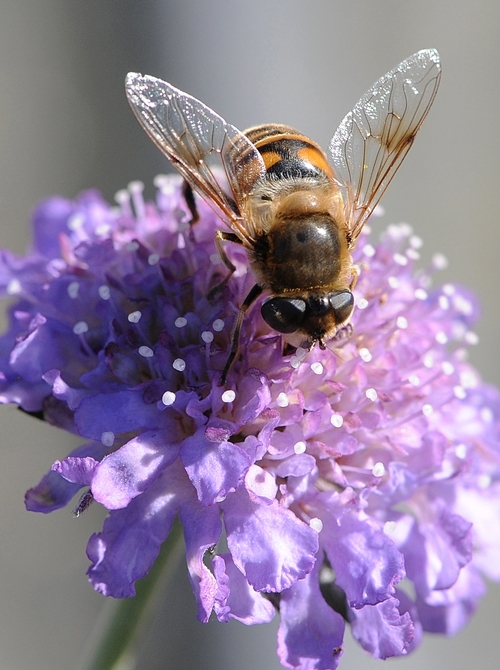 One of the syprhids commonly mistaken for a honey bee (Apis mellifera) is the drone fly (Eristalis tenax). We spotted a drone fly--the first we've seen this year--on Feb. 5 in Tomales, Marin County. It was nectaring a pincushion flower (Seabiosa columbaria) at the Mostly Natives Nursery. "There's a bee!" someone exclaimed. It wasn't. It was a drone fly. In its larval stage, it's known as a rat-tailed maggot. You'll see it in stagnant water, such as in ditches, ponds and drains. It feeds on stagnant rotting organic material. 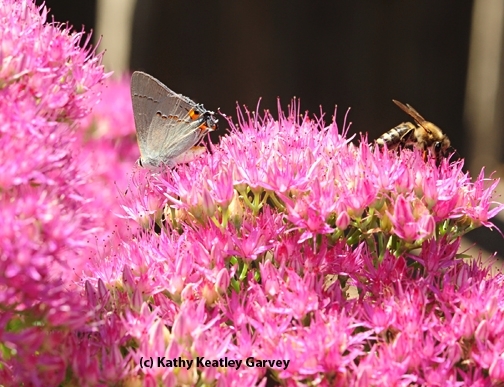 In its adult stage, it moves from flower to flower, sipping nectar and pollinating flowers. 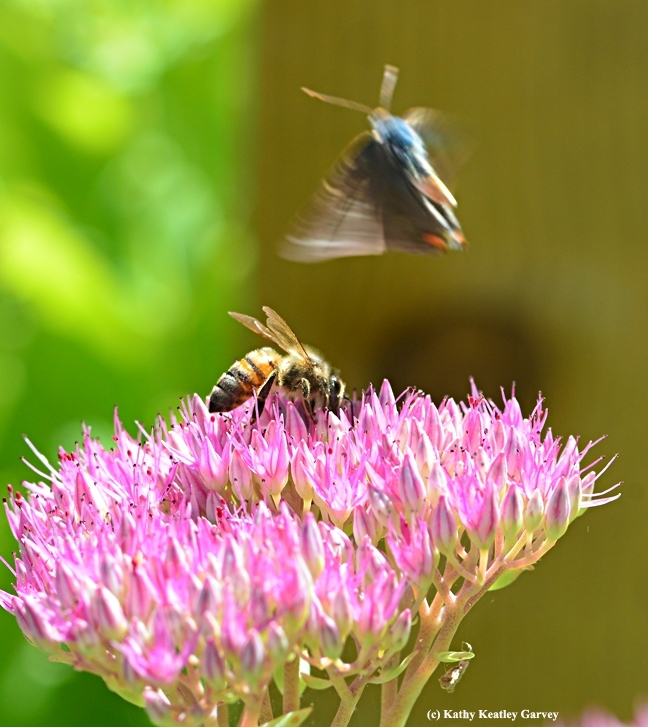 Watch it hover and you know it's not a honey bee. Look at its two wings, and you know it's not a honey bee (the honey bee has four). Lots of other differences, too. 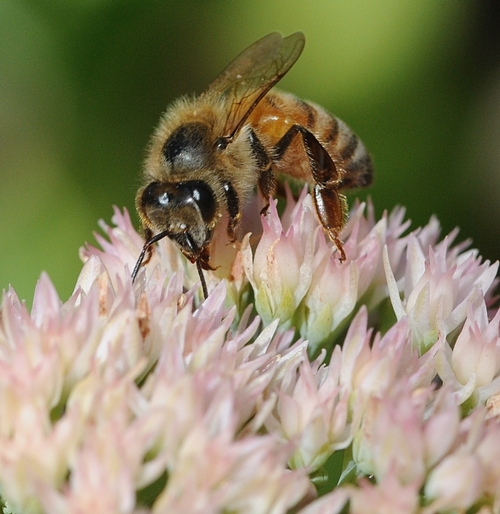 It's a good pollinator, but a honey bee, it is not. 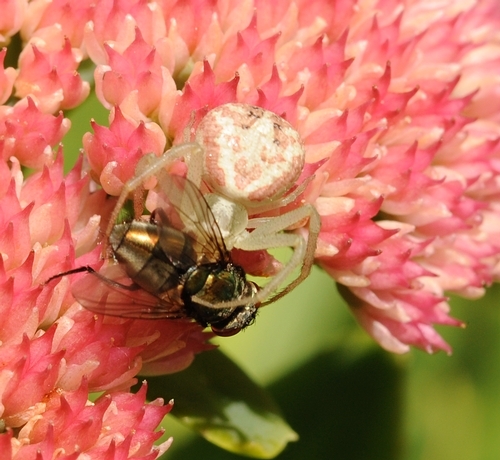 The crab spider didn't go away hungry. 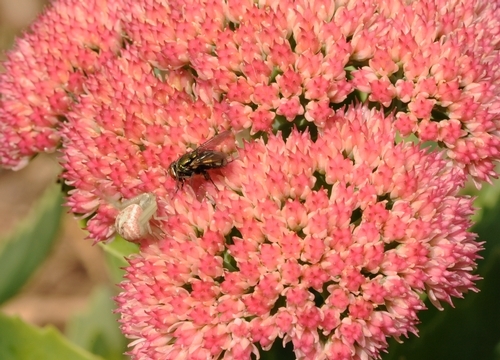 Camouflaged in the petals of a sedum, the cunning predator waits patiently for its prey. An unsuspecting blowfly lands inches from the crab spider, unaware of its presence, and crawls toward it. Wham! 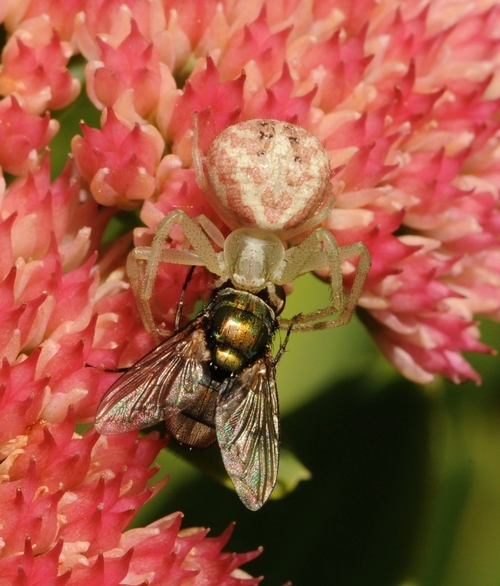 The crab spider snatches the blowfly and bites it, paralyzing it with its venom. I'm just glad it wasn't a honey bee.